Matcha (or maccha) is a well-known Japanese green tea that is traditionally used in tea ceremony. Nowadays, the finely-powdered form is widely used in all sorts of drinks and foods. Just name a few, soba noodles, bakery products, desserts, like mochi and green tea ice cream. The powdered green tea is very handy to use. The easiest way to make green tea ice-cream is just add a few tablespoons of green tea powder in softened vanilla ice cream (use Häagen-Dazs' if you desire), stir and combine vigorously, then frozen for an hour or so if you like it a bit firmer. It’s pretty easy and “cool”, isn’t it? Recently I often use my own ice cream maker as I don’t want to let it sit in my pantry without doing any job for me in this hot summer time. Last time, I shared an eggless version of banana ice cream. Here comes an easy version of green tea ice cream. If you don’t have an ice cream maker at home, you can still make some awesome ice cream as well. Some tips are to be shared in the notes below. 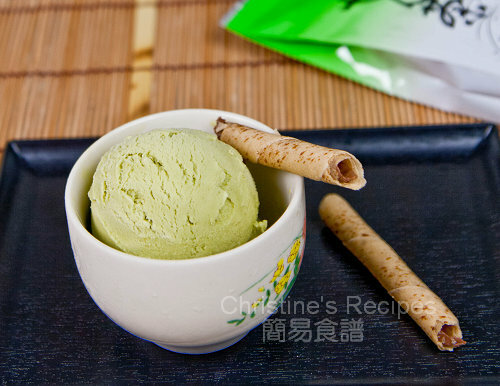 The key to making flavourful green tea ice cream is to use the good quality of Matcha powder. Beat whipping cream with an electric mixer until thickens, about 3 minutes. Stir in sugar and green tea powder into milk. Mix well. Use a blender if you have, it’s much easier. Pour the mixture into ice-cream maker and freeze it according to the manufacturer's instructions, about 20 minutes. Once the ice cream has been formed in the ice cream maker, it would be quite soft in texture. Transfer to an air-tight plastic container and place in the freezer for several hours until the ice-cream is frozen. Or you might like to have it after freezing for an hour or so. If you don’t have an ice-cream maker, you can pour the green tea mixture into a shallow container and freeze until frozen at edges. Remove from freezer and beat with an electric mixer. Pour back into container and re-freeze. Repeat 3 times. Then freeze until completely set. The degree of intensity of green tea powder varies from different brands. So you have to adjust the amount of it you put in the cream mixture before freezing. This is awesome. I've eaten matcha ice cream somewhere but making your own is much even better. It looks really creamy. Beautiful picture of the ice cream. You are good to be able to take such picture with no melting ice cream under such extreme conditions in Australia now! It's pretty hot here. I couldn't finish 2 shots if I had not turned on the air-conditioner. A georgous & fab ice ream, Christine! Beautiful picture of the ice cream!!! I am not a huge fan of ice cream, but when comes to Matcha, I am a sucker! Beautiful pictures. 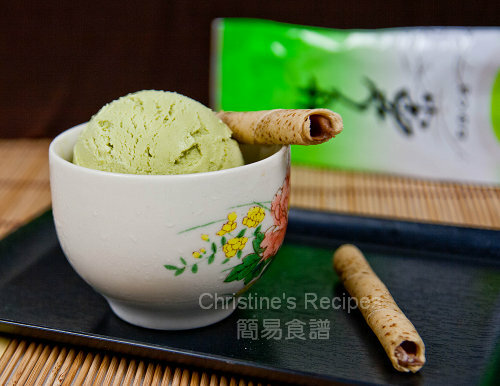 I would love to make a homemade matcha ice cream - sounds amazing! I like green tea very much. So thanks for its flavored ice cream recipe. It looks so glorious. Thanks for such delicious recipe. That looks like the perfect way to end a meal. Thanks for the ideas. I also really like the fact that its not a custard using all those egg yolks. Looks delicious! I love the flavor of matcha and will try this recipe. Thanks. matcha ice-cream is one of my favourites!! That looks lovely. I have a favorite green tea matcha soy milk frappe that I love!! Hi this looks wonderful. Where do you get your matcha powder from? What is a good one to choose? I am in Rochedale South. I got it in Sunnybank. Hi, I like your egg free ice cream and want to try. But may I ask why there is no need to dissolve sugar first? Other receipe using custard as base actually does call for the sugar to dissolve. The milk is a bit warm, so the sugar is easily dissolved in Step 2. Yum, I really enjoyed this recipe! where did you get your matcha green tea from? Enjoy the goodness of Matcha Tea. In green, certified USDA organic and many other varieties and concoctions, our selection is large and fabulous! Matcha Tea is one of the best and tastiest teas available and we have the best price and selection out there. Rich in antioxidants and a natural mood enhancer, Matcha's health benefits surpass that of many other teas. It helps fight cancer and is high in fiber content. Enjoy a cool or steamy cup of our fabulous Matcha Tea and treat yourself right!